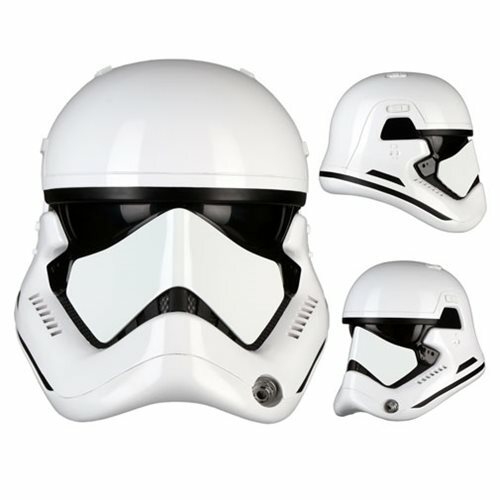 Your very own First Order Stormtrooper helmet! 1:1 scale Star Wars: The Last Jedi prop replica. Digitally scanned details from actual screen-used assets! Includes an adjustment system to ensure a comfortable and secure fit. The First Order's infantry units wear stark white armor derived from that worn by the Republic's Clone Troopers and the Empire's Stormtroopers. Fully assembled and ready to wear, this 1:1 scale Star Wars: The Last Jedi First Order Stormtrooper Helmet Prop Replica features an upgraded design that includes digitally scanned details recreated from actual Star Wars: The Last Jedi screen-used production assets! Made of injection-molded ABS plastic, it includes an adjustment system to ensure a comfortable and secure fit. Most Anovos helmets fit up to a U.S. hat size 8. Noted differences from the Star Wars: The Force Awakens variant (sold separately) include updated helmet clips, nose, teeth detail, and left-jaw aerator.